Today, I decided to abandon my work projects, the nagging laundry, and the suitcases waiting to be stuffed with our belongings for our upcoming move. Instead, I retreated to my cushy corner chair accompanied by my copy of Rose Water and Orange Blossoms. Maureen’s cookbook had become a familiar friend; I had already thumbed through it many times, folding page corners and marking a few must-try recipes. This time, I paused at the mujadara recipe. 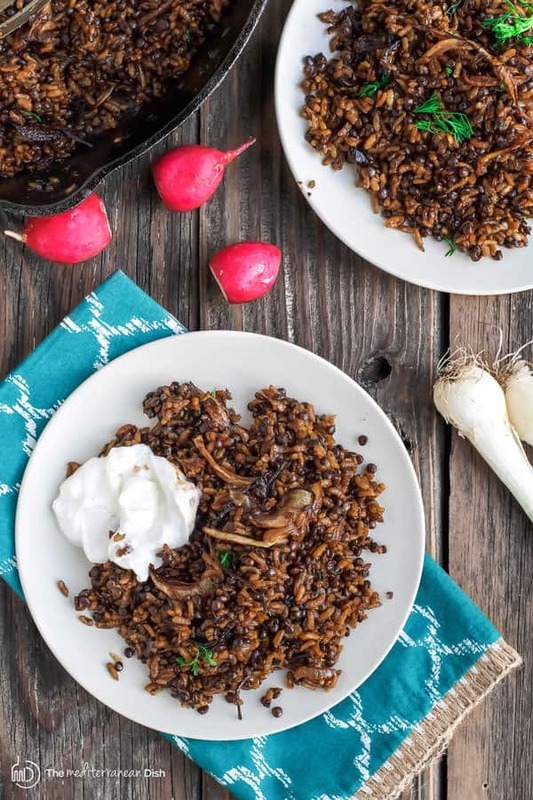 An immediate craving for a hearty bowl of lentils and rice loaded with onions, quickly rose. I got up and grabbed the three ingredients needed and some canola oil, and began to cook. Soon the smell of fried onions filled the kitchen; instantly, I was comforted. 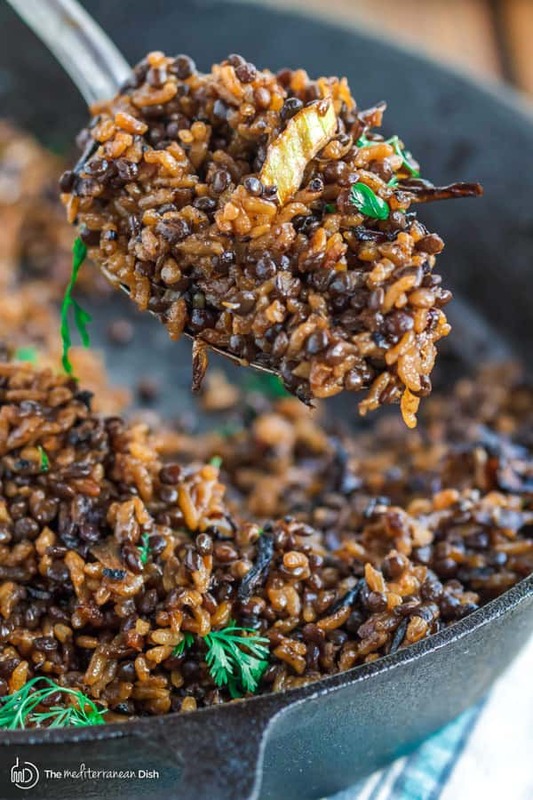 Clearly, lentils and rice do not make for a fancy meal. In fact, in the Middle East, mujadara is known more as “poor man’s food,” or peasant food. 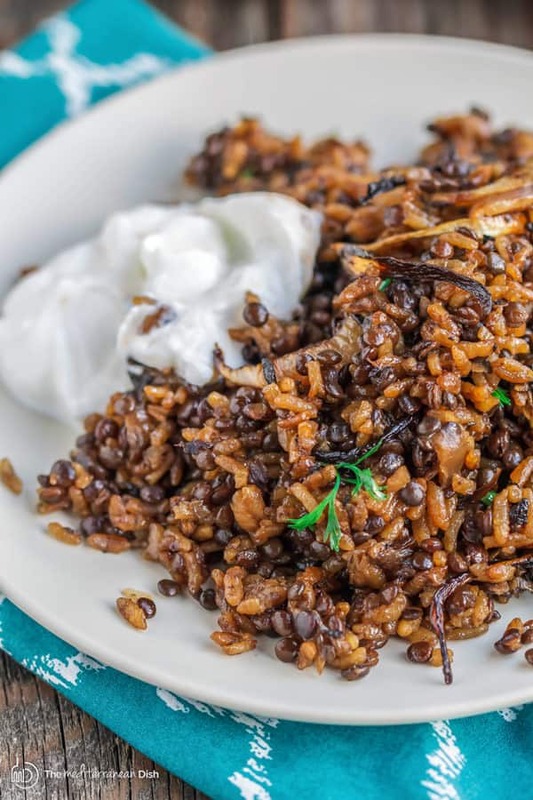 And because it is a hearty vegan option, Egypt’s Copts (Christians) often serve lentils and rice during the Great Holy Fast in the spring, when “fasters” are required to eat a mainly vegan diet for 55 days. This mujadara is very simply spiced with salt and pepper. The main flavor maker here is onions, fried to the point of dark golden brown. 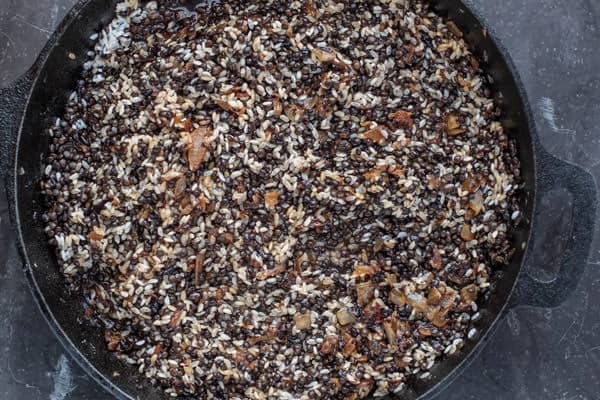 This is what gives the rice the beautiful depth, both in color and taste. 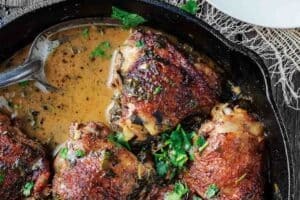 Where to find the right lentils for this recipe? The kind of lentils that is best for mujadara is small dark brown lentils. If you can not find them in your grocery store’s bulk or international food sections, they are available at health food store and places like Whole Foods. Also, Amazon offers brown lentils such as Jansal Valley brown lentils or these brown lentils by OliveNation. What to serve with mujadara? With my mujadara dinner, I often like to serve plain Greek yogurt and a side of crisp salad like fattoush or this simple Mediterranean chopped salad. Place the lentils in a small saucepan with 2 cups of the water. Bring the water to a boil over high heat, and then reduce the heat and simmer, covered until the lentils are par-boiled (10-12 minutes). Remove from the heat, drain the lentils and set them aside. In a large saute pan with a lid, heat the oil over medium-high heat. Add the diced onions and cook until the onions are dark golden brown, darker than typical caramelized onions (about 40 minutes), Sprinkle the onions with a teaspoon of salt as they cook. Carefully pour the remaining 2 cups of water, bring the water to a boil over high heat, and then reduce the heat to low and simmer for 2 minutes. Stir the rice and par-cooked lentils into the onion mixture. Cover and bring back to a boil. Stir in a healthy pinch of salt and the black pepper. Reduce the heat to low, cover, and cook until the liquid has been absorbed and the rice and lentils are both cooked through (about 20 minutes). Remove from the heat and season with salt and pepper to taste. 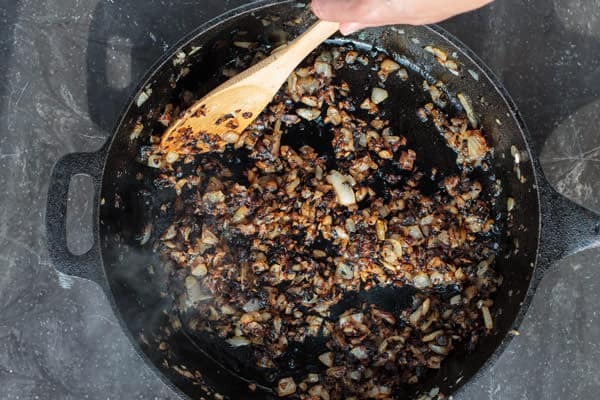 If you choose to add the fried onions garnish, heat the oil over medium-high heat (to 375 degrees F) in a small saucepan. When a small piece of onion bubbles vigorously, the oil is ready. Fry the onions in batches until they are golden brown. Transfer the onions to a paper towel-lined plate or try, and then arrange them on top of the Mjuadara. Serve the mujadara hot, warm or at room temperature. Enjoy with a side of crisp salad such as fattoush. Place the lentils in a small saucepan with 2 cups of the water. Bring the water to a boil over high heat, and then reduce the heat and simmer, cover until the lentils are par-boiled (10-12 minutes). Remove from the heat, drain the lentils and set them aside. 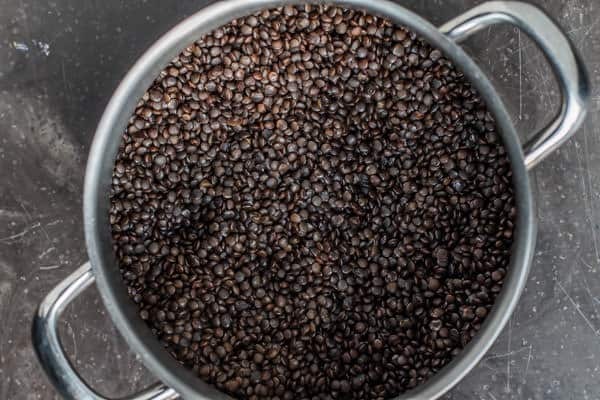 Carefully pour the remaining 2 cups of water, bring the water to a boil over high heat, and then reduce the heat to low and simmer for 2 minutes. Stir the rice and par-cooked lentils into the onion mixture. Cover and bring back to a boil. Stir in a healthy pinch of salt and the black pepper. 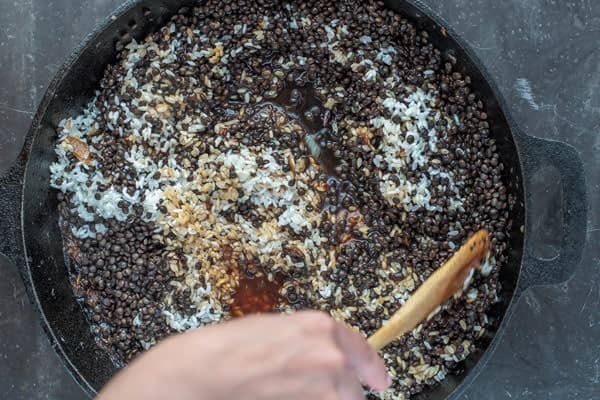 Reduce the heat to low, cover, and cook until the liquid has been absorbed and the rice and lentils are both cooked through (about 20 minutes). Remove from the heat and season with salt and pepper to taste. 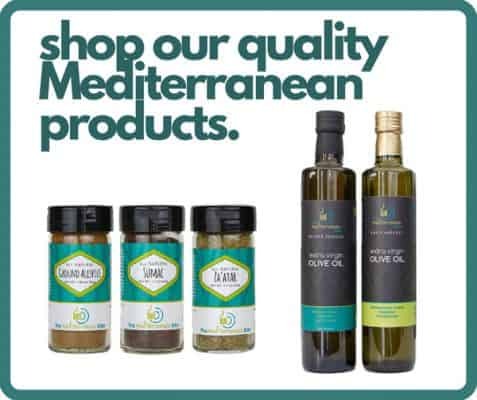 Serve the Mujadara hot or at room temperature with a drizzle of extra virgin olive oil and parsley garnish, if you like. If you are adding the the fried onions, heat the oil over medium-high heat (to 375 degrees F) in a saucepan. When a small piece of onion bubbles vigorously, the oil is ready. Fry the onions in batches until they are golden brown. Transfer the onions to a paper towel-lined plate or try, and then arrange them on top of the Mjuadara. Add a side of salad like fattoush, if you like. Enjoy! The original recipe does not call for soaking the rice in water before use. I have found that soaking the rice in water for 10-15 minutes, or until you are able to break one grain of rice between your fingers, provides better results. 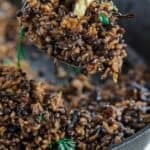 If you choose to add the crispy onion garnish, to save time, you can start this while the rice and lentils cook. I woukd love to receive your recipes from niw and then. I lived this lentil rice. Delicious. I totally love that you propose the side dishes in every recipe as well!!! I would like to make this but only have red and green lentils in the house. Can I substitute one of them fornthe brown lentils? Hi Fern, so sorry I am just now able to get to your question. 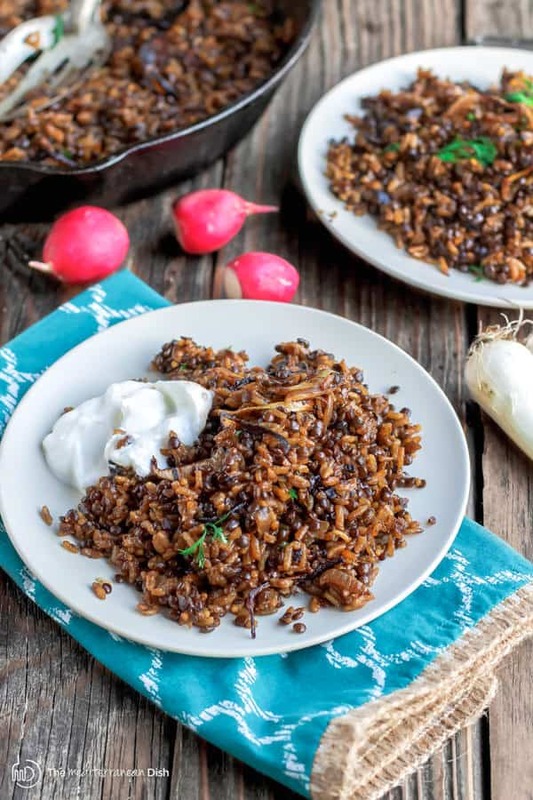 For this particular recipe,it’s best to use brown lentils…red lentils will fall apart and you will have more of a sticky rice situation than Mujadara. You may be able to use French green lentils. Enjoy! Not tried this recipe but plan to, having just eaten this for lunch in a little Moroccan place near my work. Ideas I am going to include are… Adding cinnamon and cumin, stirring through/garnishing with some fresh chopped coriander leaves (they add a really nice fresh flavour) and serving with plain yoghurt and some mango chutney on the side (somehow the sweetness balances out the flavours). Yum. Thanks for sharing, Ellanoor! Yes, I actually do add a little cumin, coriander, cinnamon occasionally. Very tasty! I know this is primarily a meatless recipe, but I had some leftover chicken that I needed to do something with, so I cut it up and threw it in at the last simmer stage. Om-nom-nom! Sam, thanks for sharing! Love to hear all sorts of variations! 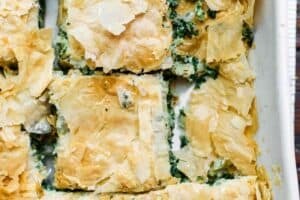 I’ve made this delicious recipe several times now and everyone always loves it! As you say, it requires a little patience caramelising the onions but that step is a must! (The one time I tried to rush the process they burnt and I had to start over). 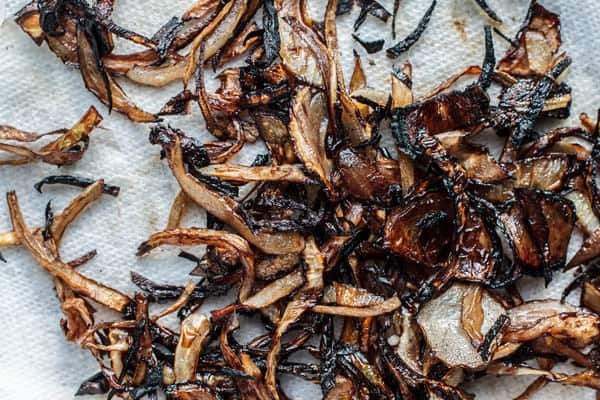 It’s also well worth the little extra effort to fry the crispy onions for a perfect finish – so, so tasty! 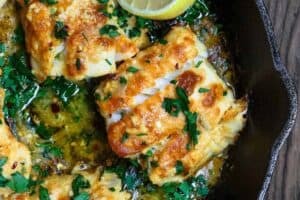 Thanks so much, this recipe is a winner! Thanks for sharing, Sonia! I love to hear this kind of feedback! I am so glad you really carmalize the onions but I miss the cumin and cinnamon spices. You can totally add those, Deb! I do sometimes as well! What a great recipe! I can’t remember the last time I used such a short ingredient list but the meal left nothing wanting. Caramelizing the onions took quite a while so I’d recommend starting those before prepping anything else. Thank you thank you! Awesome, Luke! I am so glad to hear this! Hi Helen, honestly, I haven’t tried this recipe with brown rice. Yes, I believe it will change the cooking time. I had a little brown long grain and a little brown jasmine and threw them both in – took about an hour to cook everything down (I didn’t parboil or soak beforehand) but a very tasty result. I too missed the cumin and cinnamon, so if you’re not opposed to going off book, I’d recommend adding some of each of those. 🙂 Cheers! Have to confess I didn’t get this 100% spot on. The onions were a challenge…..not difficult but personally I am having to get in to the habit that sometimes things just take the time they take…..you can’t hurry or take short cuts with these onions. With a life that is 100 miles an hour that’s the challenge! However, the thought of mixing lentils up with brown rice is already a winner for me. Lentils are just an amazing source of dietary fibre and thus adding them to rice, something I enjoy, is an easy change with a great health gain. Whilst not 100% nailed I really enjoyed the result……will be working on this one over the following weeks! Wonderfully delicious. I also ordered the referenced cookbook. I can’t wait to cook more from it. I loved this dish. I used vegetable broth instead of water. Thank YOU! Wonderful, Melinda! Thanks for sharing!!! Oh wow!! I LOVE this recipe, so easy & simple instructions ☺ it actually looked exactly like the photos lol. Thank you for sharing. Awesome, Mica! Thanks for giving it a try! Just finished making this and waiting for Hubs to get home so we can eat-devour-it. The house smells wonderful. I did make a few substitutions. Only had 1 large onion so added white part of one large leek and a small red onion and used chicken stock instead of water. May not have soaked my rice long enough because I had to add more liquid. It is soooo good. Will fry shallots to go on top but don’t think that will be a deal breaker. Not as pretty as yours but will definitely make again! 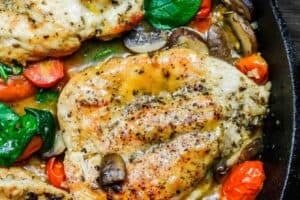 Thank you for sharing wonderful recipes. Awesome, Stacey! So glad to hear you’re giving this recipe a try. It’s one we enjoy often here. And thanks for sharing how you’ve adjusted it to fit your needs! All good ideas! I used to eat mujadara every Sunday, after church, at a small Lebanese restaurant in Arlington, VA. I so enjoyed my lunch and the family and my church friends. It was a glorious experience. I became known as the one who always asked for toasted pine nuts and yogurt on the side on the side, with salad and bread. Such happy times. I have never been able to duplicate the seemingly simple meal, even after many attempts. I know from your explicit method that I will be able to have my beloved mujadara once again soon. God bless you. Method is almost more important than ingredients, IMHO. I spent eight years in the Middle East as a child and began cooking then, but mujadara was the recipe that escaped me. Catherine, thank you so much for sharing your lovely memories with us! 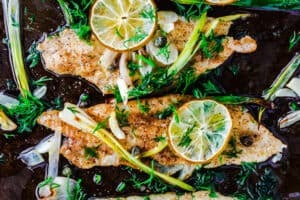 I do hope this recipe will help you make your beloved dish! Thank you for a wonderful dish. This is definitely going into my rotation. Awesome Meghan! Thanks for checking it out! I made this tonite. I was worried that it wouldn’t be flavorful with only salt and pepper. Boy, I was wrong. The onions in it and the crisp onions on top are what make this dish. I did use vegetable stock instead of water, and I used green lentils because I couldn’t find the brown ones. Wonderful! You won’t be disappointed! Thank you, Suzy. I know it, Terri! It’s easy to think such few ingredients won’t make a flavorful meal, but they do! Thanks for sharing!! !